If the term “Cloud” is commonly used by our informants, we noticed that it was a surprisingly unclear notion for most of them. As a category, “cloud computing” was hard to grasp and they provided us with several definition of what it actually refers to. Although it is a fundamental infrastructure for everyday life with digital technologies, it seems that it is not as meaningful as we expected. From the users’ perspective, the cloud is thus an intriguing research category. 1995, more “Pictures of Clouds” start to appear “denoting anything too complicated for non-technical people to understand.” Image from “A Brief History of Cloud” on Thoughts On Cloud. 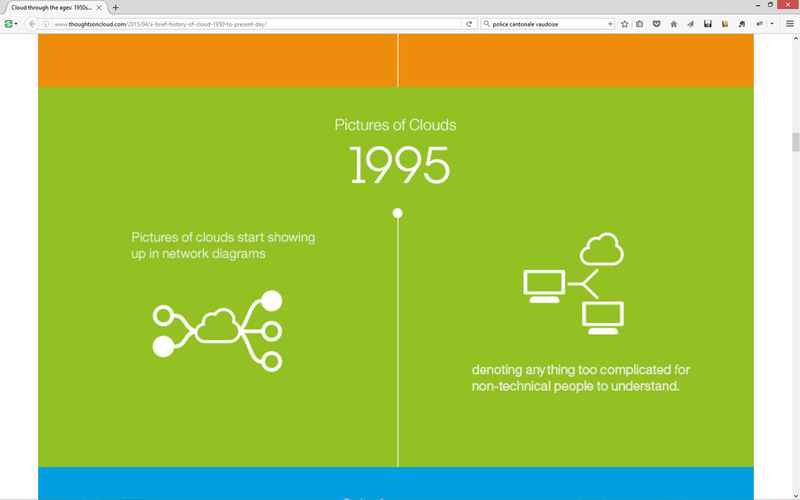 Website linked from the post “Pictures of Clouds, 1995” (21.10.2015). As usual with technology, there are two kinds of discourses: the promises from those who provide the services, and their actual appropriation by the users, which often lead to a mix pleasant surprises, frustrations, interrogations and satisfaction. However, there is a gap between these two. 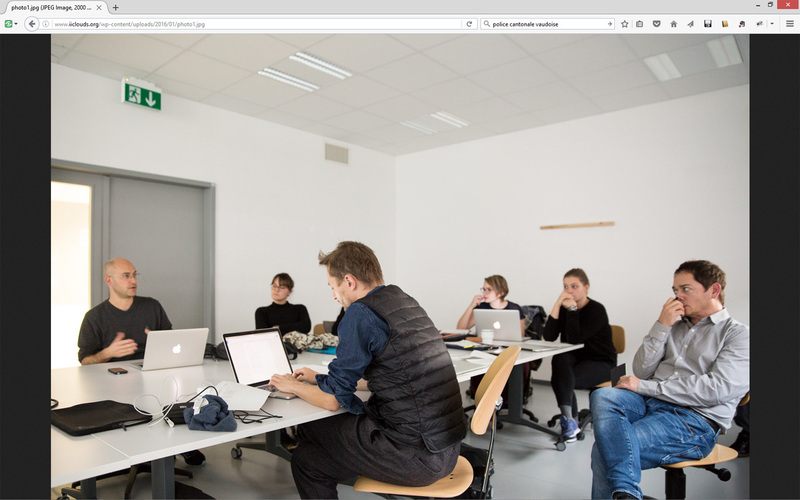 For the majority of people we interviewed, the cloud corresponds to a tiny icon on the OS GUI (Dropbox or Google Drive). Unlike the service providers’ discourse and representation (data centers, evanescent clouds of data), the cloud corresponds to a set of (small) user interfaces features, seamlessly integrated into the OS. This means that it is hard for them to separate the cloud and their operating system. As our informants reported, they “feel” the cloud when “it refreshes” or when it doesn’t work (or when there’s no network access). Lesson 3: is the cloud a set of folders? 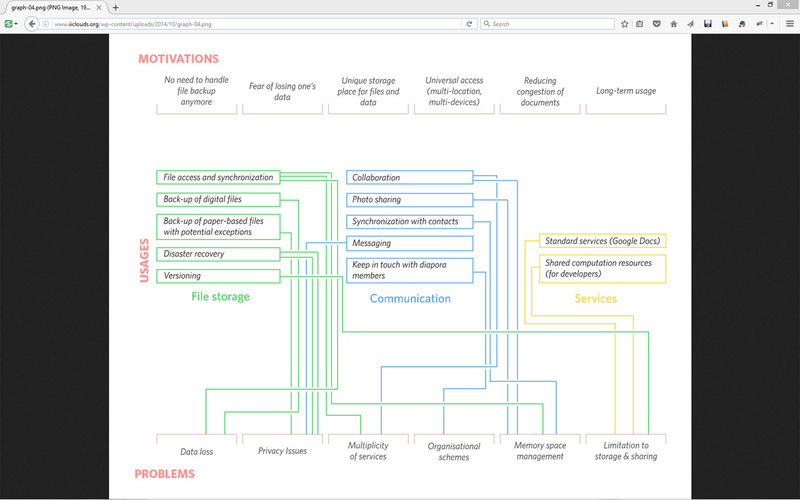 The gap between the grandiose description of The Cloud by the service providers and what the users actually as a consequence : for the users we spent time with, it corresponds to a set of folders… which actually behave differently than what they are used to. In other words, the representation of distant files/folders is perceived a misleading. The way file storage is represented gives them the impression that they would work as the local folders. But it is not the case and it leads to surprises and frustrations: disappearance of documents when someone accidentally removes a file he though was “only on his laptop”, confusion between “shared folder” and “invitation in a folder”, etc. A possible reason for this confusion is the difficulty to understand a process that is quite opaque for the users. Because, overall, cloud computing is all about “syncing” as we noticed, except that the syncing behavior of the services is difficult to understand: even when Dropbox tell users when it starts/when it’s finished, there are always exceptions. Plus cloud computing relies on constant connectivity… which is not always the case. 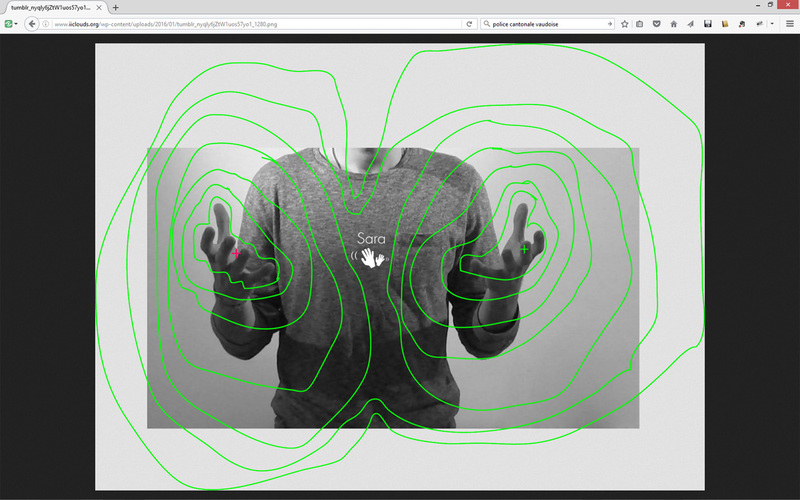 Image pulled from the post “I&IC Workshop #6 with Sascha Pohflepp at HEAD: output > Cloud Gestures“. This one was the biggest surprise for us. Although most of our informants were aware of the surveillance risks, robocopyright (automatic verification of IP-protected content), and how personal data can be used for unknown purposes… no one was ready to stop using Cloud platforms. They are concerned by these issues of course but they saw them as drawbacks, the ugly side of the facility of use/access. We are currently in the process of designing a booklet that expand on these 5 lessons with the material we produced in the field research workshop. In order to do this, we chose the format of the “almanac“, which we found quite apropos for this type of content. 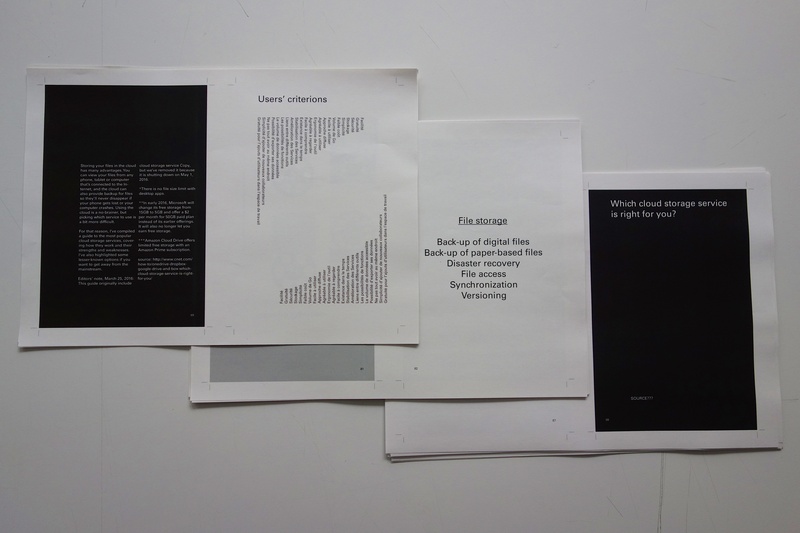 The book will feature the results of our work in a fragmentary way with a certain diversity of elements : diagrams, quotes, definitions of terms used by service provides and users, photographs, drawings, etc. 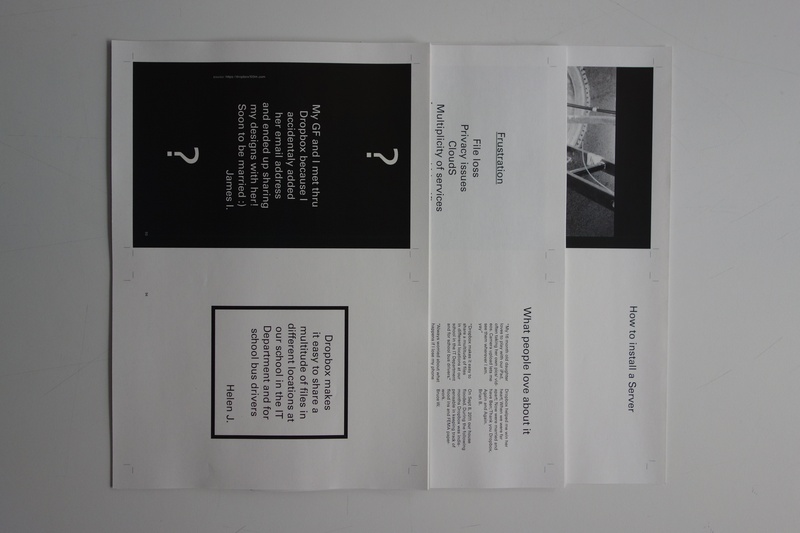 Mock-up of the booklet summing up the material produced in our field research.